Great Salt Lake identifed according to American Indian reports as 'Pearl Shell Lake'. 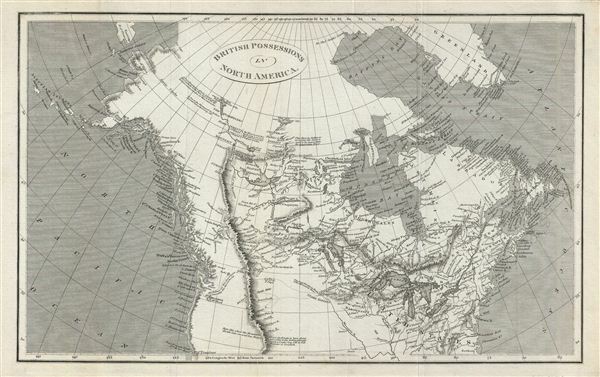 This is a fine example of the 1809 A. Arrowsmith map of the British possessions in North America, or Canada. Covers Canada, Alaska, and part of the United States from the Baffin Bay south as far as San Francisco - then an insignificant Spanish fortification. Along the way, many Indian settlements and routes are marked. The Rocky Mountains, here identified as the 'Stony Mountains,' are primitively depicted as a single mountain range, and they 'divide into several low ridges' toward the south. Several notes, including one marking the trail along the Columbia River from Mt. Hood in Vancouver to Howes Sound Lake mentions that 'the Indians say they sleep 8 Nights in descending this River to the Sea.' Drawing form indigenous reports, Arrowsmith also textually identifies Great Salt Lake, here referred to as 'Pearl Shell Lake.' In the far north the Arctic Sea, seen by Mackenzie and Hearne (1781 & 1771 respectively) - likely the Dolphin and Union Straits – are duly noted. Greenland is also attached to the mainland, as was common in maps of the period. Throughout, the map identifies various cities, towns, rivers and assortment of additional topographical details. This map was created by Aaron Arrowsmith for the 1809 issue of his General Atlas. Arrowsmith, A., General Atlas, (London) 1809. Very good. Original fold lines visible. Typical wear along folds.